Located on the outer confines of Llandudno Junction, in a favoured residential area is this four bedroom FREEHOLD semi detached town house. It offers a well presented, surprisingly spacious interior and in brief comprises; entrance hall, ground floor WC, modern kitchen with integrated appliances, spacious lounge/ dining room with French doors leading out to the rear garden. 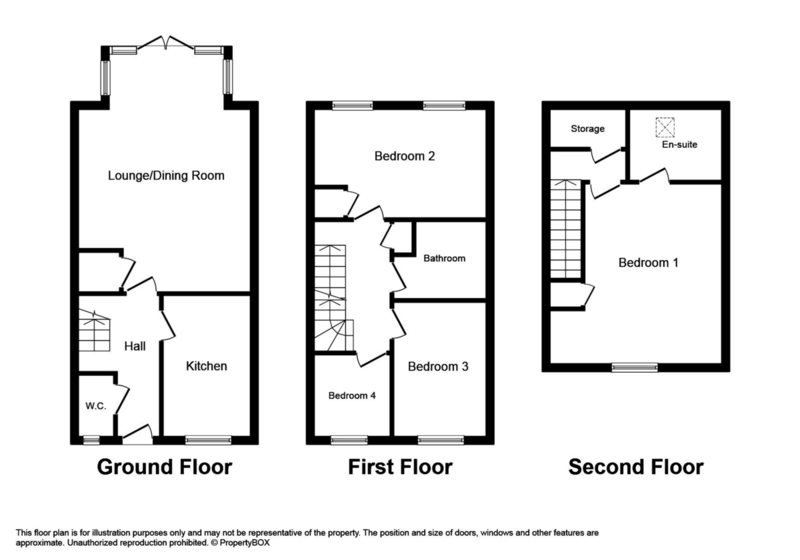 To the first and second floors are a main bathroom and four good size bedrooms with the master bedroom having the added benefit of en- suite facility. Ideal location for a growing family, as is well placed for local Primary and Secondary Schooling within the area. A variety of local shops and amenities are within close proximity in Llandudno Junction including local supermarket, post office and train station. The A55 expressway is also easily accessed with links to all North Wales Coastal towns and Chester about 35 miles. The property benefits from double glazing, gas fired central heating and off road parking to the front. Being sold offering NO FORWARD CHAIN. ENTRANCE HALL With radiator, coved ceiling, laminate floor, smoke alarm, telephone point, power points and doors leading off. GROUND FLOOR WC With a two piece suite comprising low flush WC and wash hand basin, radiator, double glazed obscure glass window to the front and electricity consumer unit. KITCHEN 11′ 10" x 7′ 4" (3.63m x 2.24m) With a range of cream high gloss fronted wall and base units and drawers with worktop surfaces over, inset stainless steel double drainer sink, built in stainless steel double electric oven, stainless steel four ring gas hob over, space for fridge/ freezer, space and plumbing washing machine, double glazed window to the front, wall mounted gas fired central heating boiler, tiled floor, inset spotlights and power points. LOUNGE/ DINER 20′ 0" x 14′ 6" (6.12m x 4.42m) With coved ceiling, double glazed windows and French doors leading out to the rear garden, carpet, two radiators, coved ceiling, TV point, telephone point, carpet, built in storage cupboard and power points. LANDING Stairs leading to first floor landing with built in airing cupboard, power points, carpet and doors leading off. BEDROOM TWO 14′ 6" x 9′ 1" (4.42m x 2.79m) With double aspect to the rear, TV point, radiator, telephone point, carpet, power points and cupboard housing hot water tank. BATHROOM 7′ 9" x 6′ 5" (2.37m x 1.98m) With a three piece suite comprising panelled bath with shower over with privacy screen, low flush WC and pedestal wash hand basin. Part tiled walls, radiator and inset spotlights. BEDROOM THREE 10′ 7" x 7′ 9" (3.24m x 2.37m) With double glazed window to the front, radiator, carpet and power points. BEDROOM FOUR 6′ 10" x 6′ 5" (2.10m x 1.97m) With double glazed window to the front, radiator, carpet and power points. LANDING Stairs leading to second floor landing, with access to roof space, built in storage cupboard and power points. BEDROOM ONE 15′ 4" max x 14′ 6" max (4.69m max x 4.43m max) With double glazed window to the front, TV point, telephone point, power points, carpet and built in storage cupboard. EN SUITE 7′ 9" x 5′ 11" (2.38m x 1.82m) With a three piece suite comprising shower cubicle with shower over, pedestal wash hand basin and low flush WC, double panel radiator, velux window, extractor fan and inset spotlights. OUTSIDE To the front of the property is off road driveway parking for two vehicles, outside tap and outside lighting. The rear garden is enclosed by timber slat fencing affording part seclusion which is mainly laid to lawn with a paved patio area and timber storage shed. DIRECTIONS Proceed out of Llandudno along the A470 towards the A55 after the Bodysgallen Hotel take the third exit from the next roundabout and at the T junction turn left onto Marl Drive and then immediately right and then left into Close Belyn. Continue to the end of the cul de sac where the property can be found on the left.